Wasteland 2 studio inXile Entertainment says the deal with the publisher of Saints Row and Dead Island will allow it to focus on the creative aspects of the game without giving up ownership or control. Score another one for Deep Silver, which has signed a distribution deal with inXile Entertainment that will see it handle the retail release of the game and physical item fulfillment for Kickstarter backers, as well as assist with QA testing of localized international versions. "This is a perfect opportunity for inXile: It allows us to continue to focus all of our energy and money into the creative aspects of the game while letting Deep Silver take our game outside of the pure digital space. This has the added bonus of allowing us to spend more of the Kickstarter funds on development while continue to retain all ownership and control", inXile CEO Brian Fargo said. "I've known the people at Deep Silver for many years and they have always been a first rate organization to deal with." 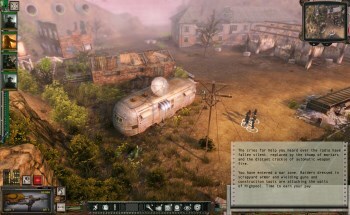 The studio noted in a Kickstarter update that the deal does not give Deep Silver any creative control or ownership over Wasteland 2, nor will it have any influence on future plans for the game or a DRM-free release. "The only real impact for our backers is that the physical goods fulfillment is in good hands," the studio said. It also looks to be a smart move for Deep Silver, which has been doing very well for itself lately. Wasteland 2 isn't going to be a major hit franchise but it's the kind of game that carries a powerful cred with gamers and could prove to be a valuable feather in Deep Silver's cap. Sell outs! It's not indie any more! RAAAAAAAAAAAAAR! Nah, sounds a pretty decent deal. I wonder just how much Deep Silver are getting out of it. If I had to guess, a cut of digital sales in the countries they localize the game for and the physical sales. I think the guys an InXile did mention near the start of the kickstarter that they where looking for a distribution partner to handle the delivery of the physical goods. Either way it's good business sense, allows them to worry about making the best game possible and have someone else take care about the logistics of printing disks and shipping boxes. This is a great way to do business. They get into markets they wouldn't normally go into but creative control and more importantly development budget stays entirely with the studio. Everyone wins, good for them! Oh dear, Silver Deep in a Wasteland. Most likely all the profits from the sales of physical copies. Oi, Andy, you should probably make it clear(er?) in the article that inXile are still handling the digital distro. Thats pretty much the timbre of half the posts on the KS site right now *sigh* except without the Irony. Personally i want these guys to run with it and make W2 a massive success, some people just cant be told though i guess. It's best to let professionals stay in their profession and outsource their non-specialty to a master in that specific trade. Thankfully Brian Fargo has been in the business long enough to know the best deals. I'll trust his judgement.